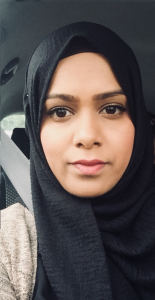 Nasreen, from Wednesbury, was looking for an opportunity to take up an active role in her community to make a difference, so when her workplace signed up with Inspiring Governance to promote the opportunity to become a school governor, she leapt at the chance. In addition to her role as a governor, Nasreen goes into schools to give careers talks. Nasreen also works as a voluntary careers mentor at her workplace, helping colleagues update their CVs and often recommends school governance as a way of upskilling and building confidence. It’s no coincidence this experience has led to her putting herself forward to being appointed the careers link governor at George Salter Academy. “They were looking for someone to take up the role as a careers link governor, to be a link or be a liaison between the governing body in this particular area,” explains Nasreen. “Again, it’s talking about accountability, and I’ve put forward that I can come in and do careers talks as part of me contributing to my role as governor and helping shape the future. But it’s not just what Nasreen has provided to schools in her role as a governor, she is clear that the skills flow in both directions. Nasreen estimates how much time her governor work takes – “we have a two-hour meeting once a month during the school term time then the odd hour here and there if there is any training required, but anything voluntary, like the career talks I want to do, will take more time. I’m lucky that my workplace, HomeServe promotes governance and allows you to have time off for governor meetings or anything governor related. That’s why with this role I can do a bit more than in my last school where I didn’t have that support. “I would say to anyone thinking of becoming a school governor – give it a try. It definitely built my confidence and helped my leadership and communication skills. You get a lot out of it, and it’s rewarding to help a school do well and give something back into your community”.